We provide fun, educational classes for children and their parents. 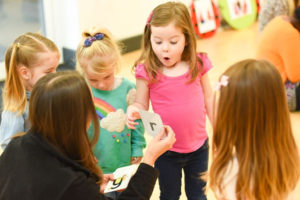 With plenty of singing, dancing and games, we make sure that learning has never been so much FUN! Our Jolly Jumpers class is designed for children aged 2-3 years and is Stage 1 in our programme. Children will start to learn their phonics with the use of fun visual pictures, numbers, colours, shapes and much more. LeapAlong’s Jolly Jumpers classes bring new and exciting activities for children and grown-ups to enjoy together. 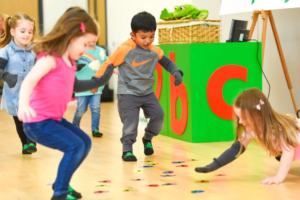 Each class is themed around a sound from the alphabet and with the use of props, puppets, games and plenty of singing and dancing, we will create a fantastic atmosphere that encourages participation and builds your children’s confidence whilst they are learning. Each week the class will have been put together to cover your child’s three key developmental areas with the help of Early Years Foundation guidelines. All these will support your child’s development, giving them a great start to any future changes their little lives take, like starting pre-school, nursery and eventually big school. Our Leaping Learners class is designed for children 3-5 years and is our final stage of the programme. During these sessions, we will be focusing on getting children prepared for school and giving them skills to have confidence in learning. They will start to learn their phonics without the fun visual pictures, so they do not become reliant on them for recognition. We will start to use number, colour & shape recognition to complete tasks independently with unique games designed by us and only for LeapAlong. We will still use our wonderful props, puppets, singing, dancing & action songs, but they will be adapted for your child’s age and development, keeping within our belief that learning should be fun.